Just 5 minutes drive along the waterfront from the Derwent Sailing Squadron is Tasmania’s premier club for junior sailing, the Sandy Bay Sailing Club (SBSC). Renowned for producing champion sailors through its training and racing programs, the SBSC focuses on providing every member with the opportunity to be the ‘best sailor they want to be’. That when utilising the DSS clubhouse facilities, SBSC members receive the same discount as DSS members (e.g. members’ discount on food and bar items). The SBSC’s most popular programs are its Tackers Learn to Sail programs (10 weeks on Saturday mornings or 4 days during school holidays). An alternative entry point to sailing at SBSC is as a crew member on an international cadet. This is often a great place for children to start their sailing experience, under the watchful eye of an experienced older member. Like the DSS, the SBSC is a friendly and welcoming club with a strong band of volunteers. Parents enjoy the camaraderie on the foreshore as much as the children enjoy the activities on the water. For more details on the SBSC, please visit www.sbsc.yachting.org.au. 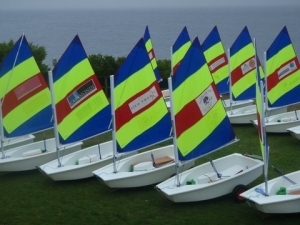 Sandy Bay Sailing Club (SBSC) offers a range of Learn to Sail programs conducted over either an 8 – 10 week period or in short blocks during school holidays. More information is available on the SBSC website.